What do you do when approached by an unpredictable shark in the open ocean? Laughter could be heard echoing out of the steel hull of a schooner drifting 40 miles offshore from Hawaii. The occupants were reviewing footage shot on the maiden deployment of an ROV that was designed to clean the world’s first drifting aquaculture pen. Almost as soon as the unit hit the water it was dragged sideways for a few hundred meters. The culprit showed up on the first images captured by the vehicle and continued to circle our robot even after the initial strike. Large fins tipped in white flashed across the screen. As our injured robot limped back to the boat for retrieval, I contemplated the encounter I had with the same animal a mere hour before. The animal in question was an oceanic whitetip shark. At first glance, it is easily confused with its peaceful reef-dwelling doppelganger, but don’t be fooled. Whitetips of the oceanic variety show up downing an extra pint of adrenaline on an empty stomach. The result is an agile, quick-tempered animal with the gall of a drunk on St. Patty’s Day and strategy that would baffle a velociraptor. They don’t have the fame of tiger sharks, the legendary status of great whites or even the ability to swim up rivers like the bull, but they have more notches on their belt than all of those brutes combined. Because they clean up at-sea disasters, the exact number of human fatalities is vague since their victims are often only reported as “lost at sea,” but their resume includes such legendary tales as Brett Gilliam’s tech diving thriller and Quint’s tale of the USS Indianapolis debacle referenced in Jaws. 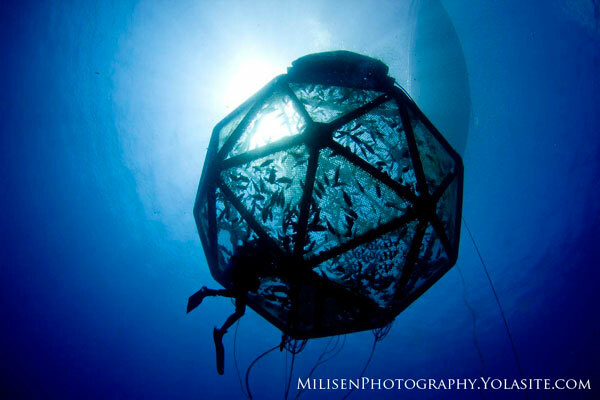 In spite of their harrowed history, oceanics remain at the top of many a diver’s bucket list. 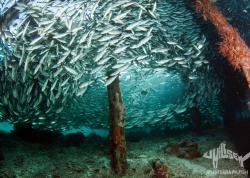 Their swaying swimming pattern mixed with sweeping long pectoral fins makes for an enchanting view. 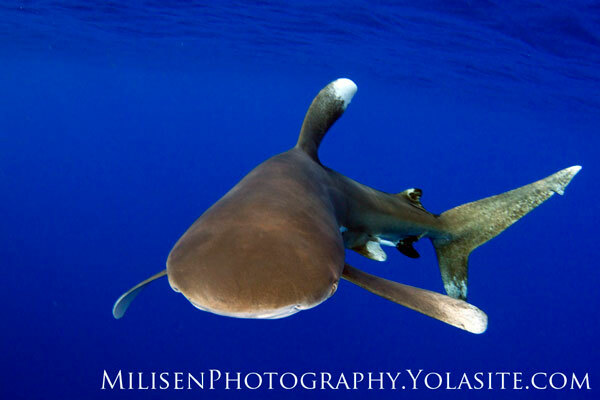 To a working diver, however, an edgy oceanic whitetip can mean the end of the workday. Earlier that day I splashed hoping to scrub fouling from the cage. Before I could yell to my buddy, a medium-sized oceanic whitetip had zeroed in on me. The animal started nosing a carabiner that I was carrying, so I dropped it only to watch it disappear into the mouth of the animal. Soon, the shark lost interest in the new toy and came back towards me. Divers on the project always carried a shark defense device. Most preferred an item we dubbed “shark pokers” that were simply a length of 3/4“ PVC to prod the animal away. My camera was big enough to serve as a sizable bite, so I relied on it instead. Besides, animals that want to eat you make great photographs. After making a couple of darting charges, the shark started circling well inside of arm’s distance. 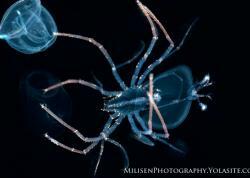 I simply spun around with it, keeping my camera housing between the beast and myself. The word the captain used to describe the scene was “wrestling.” With the shark distracted by me, my dive buddy was recalled and made his way up the ladder. I resorted to trying to push the animal away with my strobe arm, except the animal was too quick and would dodge each attempt. Finally, as I was making my way back to the vessel, I jabbed one too many times and the frustrated shark spun and snapped, narrowly missing my plastic camera housing. 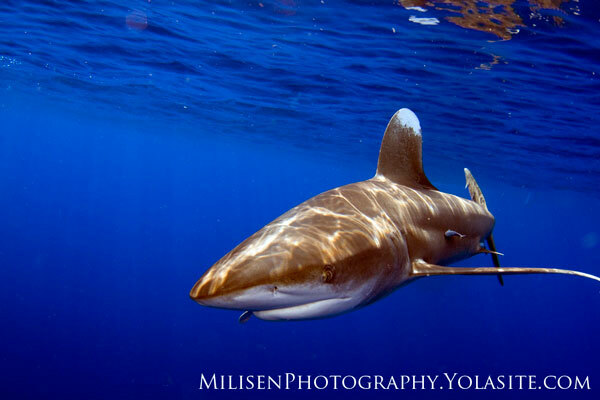 We saw many oceanic whitetips during our 6 months diving at sea, but this is the memory that sticks. The ability of the relatively small shark to take control of the situation was fascinating, and it is this very same tenacious nature that has helped drive them to the brink. 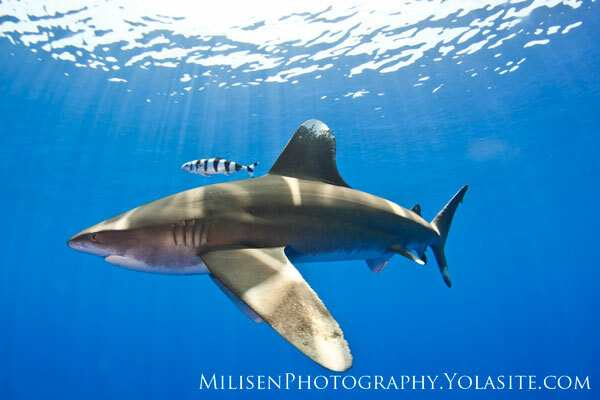 In the 1950’s, oceanic whitetips were considered the most common large animal on earth. 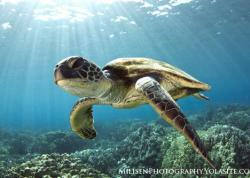 Sixty years later it was listed on CITES Appendix II. Some studies estimate that, in that 60 years, more than 95% of the oceanic whitetips disappeared, victims of both commercial bycatch and the barbaric shark finning industry. 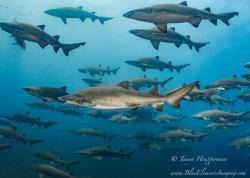 I shudder to think of a world without top predators, and that’s exactly where we are headed. Oceanic whitetips may be dance-on-the-ceiling crazy, but that’s exactly what makes them so special. They are a reminder that, no matter how big your truck or well-groomed your lawn, we are all still a part of the food chain somewhere.